I remember hearing about Surefire flashlights on all the knife forums and thinking to myself, "how good can they be?" 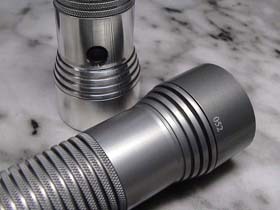 I soon found out after taking the plung on a previously owned satin grey Surefire E2. That light didn't leave my pocket from the first day I got it and now in addition to my knife, I always have a flashlight with me. The E2 has long since moved on, but there are many that have taken its place. You'd be surprised (I sure was) how useful a flashlight can be even in the daytime. You don't need to spend a hundred bucks on a light now as there are really great affordable lights out there, but there sure are a lot of expensive lights as well. Great if you are afraid of the dark or just want to "light up the room." Custom Lights Custom lights are a fairly new product. As opposed to modified lights that take existing production lights and modify them to make them different/better, custom lights are completely custom made. Usually these are designed from the ground up from body to circuitry, but they also sometimes use existing parts (the bulbs are pretty much always existing parts). Modified Lights We've all had things where we thought to ourselves, "if only it did this," or "if only I could change this." That's basically the theory behind the modified lights. Modders take an existing flashlight and try to improve on the design. There are quite a bit of talented modders out there and as a result, I have much better lights to go along with my much lighter wallet. Production Lights There used to be only a choice between a Maglite, or a plastic bodied 2 dollar flashlight, but there are quite a few production flashlight companies who have entered the fray. Now consumers have much better options for affordable production lights and with all of the recent disasters the world has seen, it has become more and more apparent that a good light is essential.